^ Kortlandt, Frederik (2009), Baltica & Balto-Slavica, p. 5, "Though Prussian is undoubtedly closer to the East Baltic languages than to Slavic, the characteristic features of the Baltic languages seem to be either retentions or results of parallel development and cultural interaction. 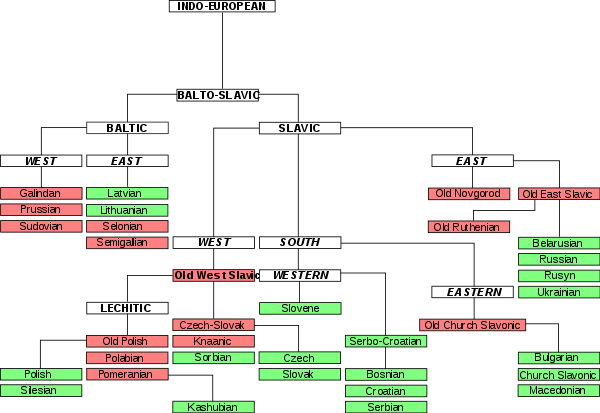 Thus I assume that Balto-Slavic split into three identifiable branches, each of which followed its own course of development." ^ Derksen, Rick (2008), Etymological Dictionary of the Slavic Inherited Lexicon, p. 20, ""I am not convinced that it is justified to reconstruct a Proto-Baltic stage. The term Proto-Baltic is used for convenience’s sake."